I've been playing catch up this week with several school projects. Instead of one large work screwed into the wall, these schools will have smaller hangable panels. So, I was able to bring them home to grout (in the driveway) and will return them this week. This one was created with 5th graders at Baileywick Elementary in Raleigh. Students worked with art teacher, Carly Savage, to develop patterns that were inspired by flags. They looked at color, shape and pattern as well as the symbolism and meaning behind each design. Students were able to take their design on paper and with some modification, translate each section into glass mosaic, then worked one on one with me to adhere their section in place. 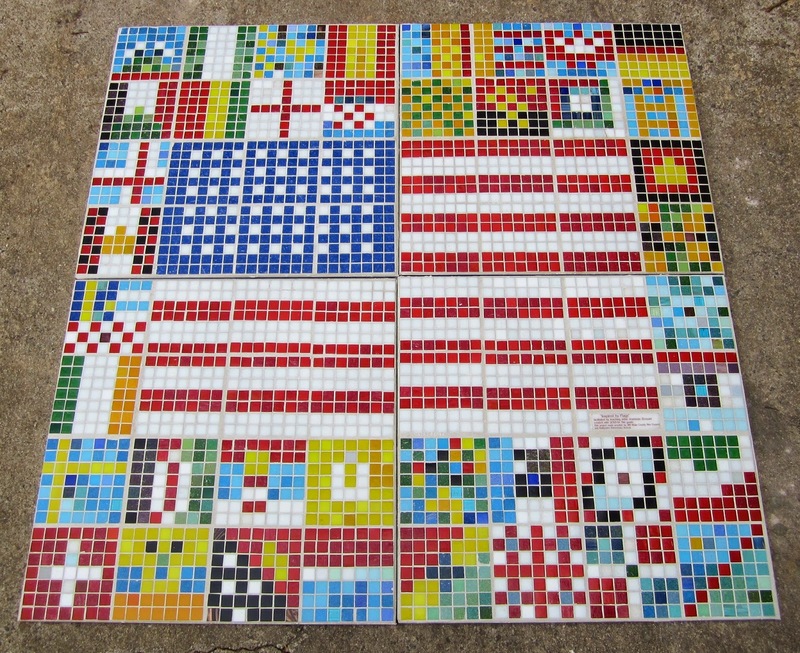 It is four 2x2' sections that can be hung in this configuration to highlight the flag of The United States. This project was also done with 5th grade students, at another N. Raleigh Elementary, Harris Creek. Each of these panels are 3x2,' and teachers expressed a desire to combine both of my making techniques: squares on the grid and free form mosaics. Some students had a graphed letter pattern to create the phrase borders and worked individually, other students worked in small groups to create the NC state icons; bird, tree, fish, and flower. Learning about NC is part of the standard curriculum for 4th grade, so all of these students were able to render these icons very nicely with tumbled stained glass.